Whether your home needs a complete siding replacement or you're looking to repair a few panels, the professionals at Straight Line Roofing & Siding can help. We are a locally owned roofing and home improvement company that prides itself on expert knowledge, quality products and affordable pricing. 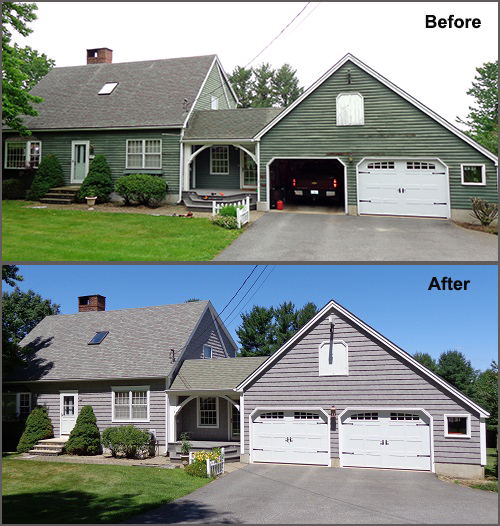 Straight Line has become well known through out Central & Southern Maine for being the premiere siding professionals, specializing in Certainteed & Mastic lifetime vinyl siding, as well as all types of cedar clapboard and shingled siding. Straight Line has completed many homes with "cedar impressions & cedar discovery" type siding, as well as their professional trim work with Azek trim boards and Mastic aluminum trim sheet. Vinyl siding, fiber cement siding, steel siding and cedar siding all have their benefits and downside. Consider wear and tear brought on by weather conditions, level of maintenance, and, of course, cost. There is no right or wrong when it comes to choosing siding; it all boils down to what works best for each individual homeowner. Our team will walk you through your options and help you make an informed decision. We can remove and dispose of your existing siding and install house-wrap and foam board insulation to make your house more energy efficient, saving you precious money. We work with top quality materials by some of the leading manufacturers of building products in North America, and back them up with professional service, pride in our craftsmanship, attention to detail, and our 5-year workmanship warranty. Contact us at 207-786-4414 and we'll be happy to answer your siding questions. You can also fill out our online form to set up a convenient time for a free estimate. We look forward to assisting you.